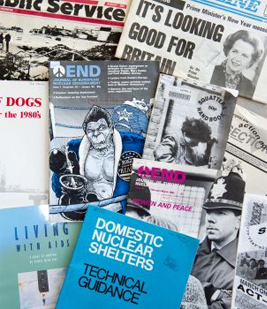 The value of digitising these collections and disseminating them as open educational resources is that currently no established historiography of the 1980s exists. The decade is largely represented as polarised and the work that does exist is similarly divided into oppositional camps. By bringing together these resources, students and academics will be able to make and illustrate connections across and between these polarised approaches. Additionally, a key benefit for educators at all levels is in the raw nature of the information and its potential use across subject areas such as politics, sociology, oral history, cultural and media studies, linguistics, gender studies, narrative and memory studies, migration studies, folklore studies, anthropology and contemporary history. We have selected 23 men and women of different ages, from different social backgrounds who write for Mass Observation, and chosen extracts from their writing over the whole decade. Similarly, we have selected 26 interviews from the British Library Oral History Collections to provide complementary audio extracts and to ensure a broad coverage of key themes. The material will be digitised and offered as an open educational resource embedded into the University of Sussex VLE (using open Moodle software) and offered on an open ‘guest access’ Moodle site. It will also be available from the Talis Aspire reading list system at Sussex, using the Labspace facility on the OpenLearn Open University site and through HumBox and JORUM as well as via other educational resource sites such as the British Library. The project supports institutional goals relating to inspirational teaching and enriching the student experience. It also increases the accessibility of the Mass Observation and British Library Oral History Collections, and enhances opportunities for innovative collaborative research and project partnerships among the academic community. 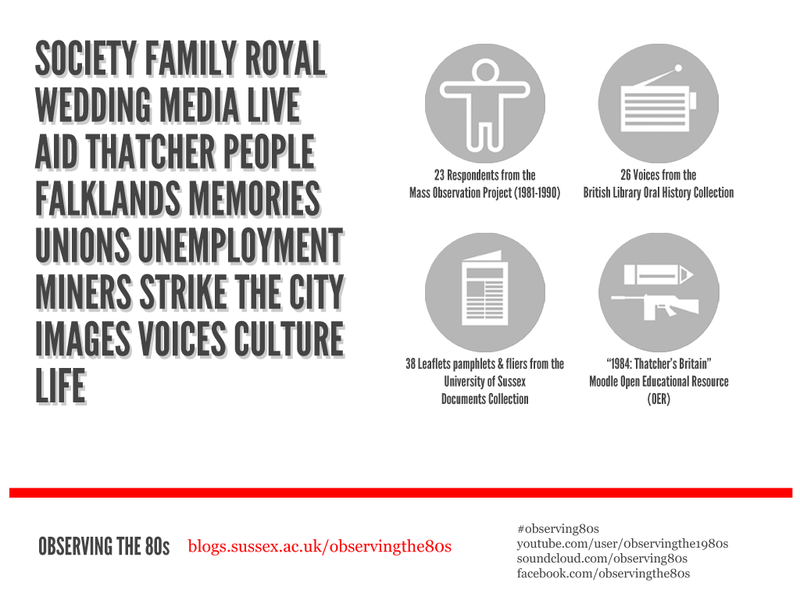 19 October 2013 – BBC Radio 4, Archive on 4 – Fiona Courage and Jessica Scantlebury talk about how the Mass Observation Project has recorded time. Samantha Fennessy, Ruth Kelly and Beth Howgate Rachel Lepley, Rebecca Rowe, Claire Chevalier-Nash, Ella Hunter Johnson and several others also did research on the ephemera which enabled us to make the selection of documents for publications selection of the resource. Charlie Green, Lucy Zabaneh, Emma Whale, Sophie Morsman, Max Levy, Glenn Raymond, Tom Guha, Lily Winslow, Amanuel Tewodros, Rachael Welsh Michael Whitehead were interviewed for the Observing 1980s film, which was made by Kevin Reynolds. Cataloguing work was undertaken by Karen Watson (Special Collections, University of Sussex) and Alexa Neale. Rose Holmes putting links into the OER and Rose Lock (Special Collections, University of Suusex) made the AR app. David Guest (ITS, University of Sussex) made the infographics for us and Suzanne Rose and Kirsty Pattrick (Special Collections, University of Sussex) have run numerous outrach sessions using the material.